Mary Texanna Loomis was born near Goliad Texas in 1880. Her early life is unknown except that she spoke 4 languages and didn't mind getting dirty. She was a blue-collar gear-head and was all about radio. She wrote the book Radio theory and operating, a student handbook of radio. At the age of 30 she founded one of our first radio schools, the Loomis Radio School in Washington, D.C. Shorpy.com has a great picture of her here. (and check out the shoes) I have found one article, a reprint of a short bio published in the Dearborn Independant 1921. "Mary Texanna Loomis (8089) was the second child born to Alvin Isaac and Caroline Loomis. Though born on a homestead in Texas on August 18, 1880, by 1883 her parents had returned to Rochester, New York and then on to Buffalo where Alvin became president of a large delivery and storage company." It tells us essentially nothing of what woudl posess this woman to found a radio school. The Loomis Radio School has it's own experimental license 3YA and was located in Washington, D.C. at 401 Ninth St. N.W. the school taught not just the basics of radio, but also carpentry, drafting and electrical fundamentals. You have to remember in that era, radio components were hard to come by. A would be broadcaster would be building every part of his apparatus from scratch. 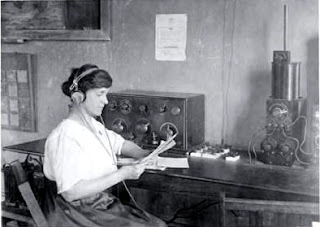 In 1920 they began offering a course plan toward a commercial radio license and later they moved on to 4-year degrees. There's a lot of mystery in her tale. We don't know when the school was founded, nor when it closed, only that it operated through most of the 1920s. She died in 1960.